“I am confident that I found the right person to help me when I contacted Heliotropic Systems." “Imagine, a one-hour "Technology Tune Up" and Larry cleaned up the problem I called him about in the first place, was able to convey all of the technical information about what he was doing - and why - in plain English, so that I could understand, and worked to make things right with my computer. My computer has never been better!" 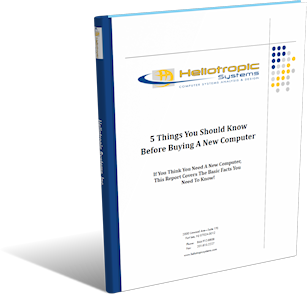 “Heliotropic Systems provides excellent service. Larry's advice is always timely. You can't ask for a nicer consultant to service your home computer." “Heliotropic Systems, ‘thank you’ for the great service! Larry, my computer is running much faster - and I can get my work done without any interruptions. I appreciate your professionalism, the pace at which you worked through the problems, and the intelligent approach you took to resolve them." “I really like and appreciate that you answer questions and emails quickly. Plus, you make appointments right away; you didn’t make me wait a week for service, like some other computer technicians do. I was happy with the whole 'new computer purchase' process from beginning to end. I loved that I knew you weren’t going to try to tell me to buy something I didn’t need. You listened to my requirements, asked the right questions, and found me an amazing deal on a top-notch computer. You then were great when you set up my new computer and made sure everything was transferred from my last two computers on to my new laptop. Not to mention the great follow-up! I think one of the biggest benefits from working with Heliotropic Systems was the process from beginning to end. I felt very secure that you were handling everything so that I didn’t have to even think about it." “As a small business owner, I value Larry's fast response to my calls. I am extremely pleased that he has the ability to quickly address my computer problems and fix them. Thanks to Heliotropic Systems, I can now print my documents in half the time it used to take me. That's a huge benefit for my business." “I wanted to say, once again, "Thank you for your help last week." This note is just to give you an idea of how fast you made my printer. This past Thursday I had two closings; one at 6:30 pm and another at 8:30 pm. I was delayed coming home from a doctor's appointment, so I wasn't able to start to print my documents until 5:45. I printed both of the documents - 100 pages each, with 4 copies - in less than 15 minutes! And I was only 5 minutes late to my first closing." “If I had to say two things about Heliotropic Systems' services, it would be "prompt" and "expert." Our recent computer system replacement was quick, clean, efficient, and had an excellent outcome. As a result of Larry's work we now have the full use of our lab." “I like everything about your service. You were polite, knowledgeable, and very pleasant to work with. As a result, my computer - a new netbook - now works!" “Larry is the antidote for the frustrations of the technologically challenged! He patiently addresses your problems and concerns, and resolves them for you." “I like that you showed up when you promised to. And then you listened intently to the problems I was having with my computer. After you heard that I was on the phone with another tech support company for more than two hours, you then went to work right away. I am impressed that you wouldn't give up until you solved the problem. I can only imagine the amount of research you had to do to get my system back in working order. But I am very satisfied with how quickly you resolved this problem. The biggest benefit is that my computer is working again, and I don't have to purchase a new one." “When I contacted Heliotropic Systems about getting a new computer, I had some reservations because I was so used to the old one. Larry understood that and answered all of my questions. The result was a very easy transition from the old to the new system. The best part of working with him is that knowing when I run into a problem, I have a great computer technician to call on!"